Wow...2 years??! I still remember the day I decided to start this blog...I was full of hesitations...but I was stubborn enough to give in to my dream of having my own recipe site...and I am so glad I did! Not only did I meet great people and made new friends, I've also learned a ton, and I got the chance to share with the whole world something that I love to do --- COOKING, that is! I am truly amazed when I think about it and how far Pinay in Texas Cooking Corner has gone in the past two years. And even though I haven't been active last year as I was during the first year, our readership increased 5X...and to date, PiTCC has already been visited by people from 189 countries! That, for me, is a big accomplishment! I want to dedicate this post to all of you, without whom Pinay in Texas Cooking Corner would simply not be what it is today. A big thanks to each and every one of you for giving me all the support and encouragement that kept me inspired in the past two years. Your comments and e-mails have always made me happy and smile, and for that I am thankful! Knowing that I am able to help in my own little way through recipe sharing gives me so much joy! It has truly been a fruitful two years for PiTCC, and I owe it to all of you! 1. Preheat oven to 350F. Line two 9" round pans with parchment paper. Sift all dry ingredients and set aside. In a bowl, whisk together egg yolks and 1/2 cup sugar over medium speed, until creamy and light yellow in color. In a small bowl, dissolve coffee and cocoa powder in evaporated milk until free from lumps. Pour into the yolk sugar mixture, along with olive oil, and beat until well combined. Add dried ingredients into it and beat over low speed until well incorporated. 2. 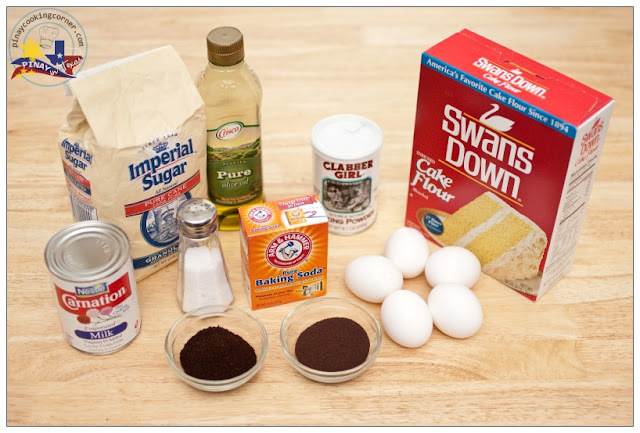 In another bowl, whisk egg whites and 2 Tbsp sugar over medium speed until soft peaks form, and then fold into the mocha batter, a dollop or two first to liquefy the thick batter, and then in thirds. 3. 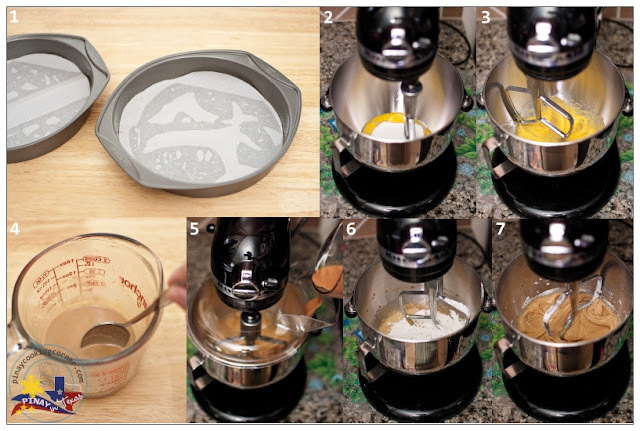 Divide the batter between two cake pans. Bake in preheated oven for 20 to 25 minutes or until a toothpick comes out clean when inserted in the middle. Remove from oven and allow to cool down for 10 minutes, then carefully turn over on the wire rack. Peel parchment paper and Cool completely before frosting. 1. Heat up the whipping cream in the microwave for about 30 sec. Dissolve coffee and cocoa powder in it. Add vanilla extract. Stir until well combined. Set aside. 2. 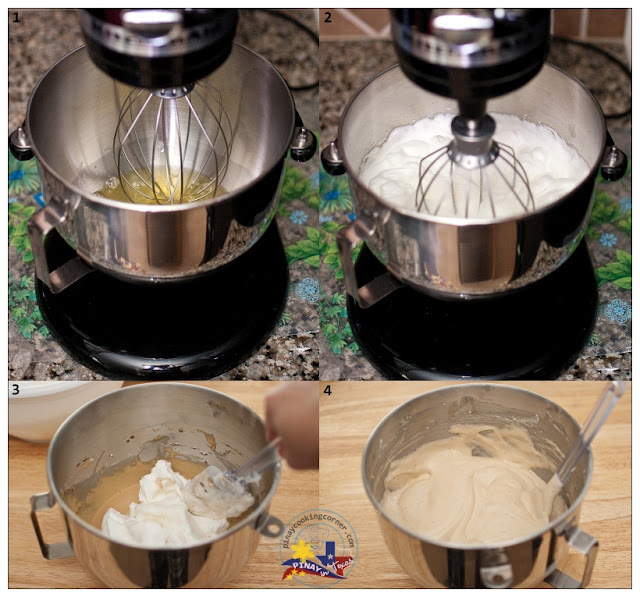 Using a mixer on medium speed, cream the butter in a bowl. 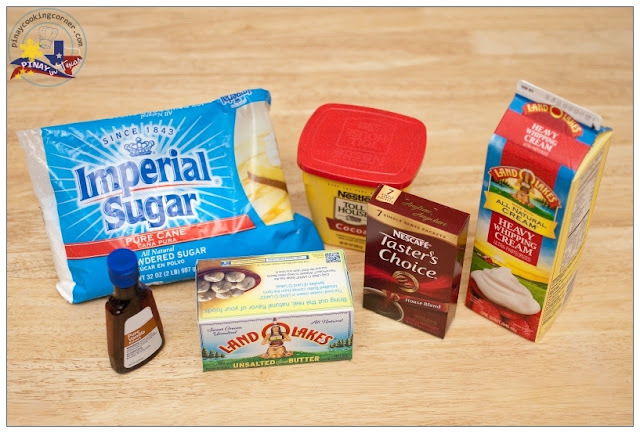 Adjust the speed to low and add the confectioners sugar. Beat until incorporated. 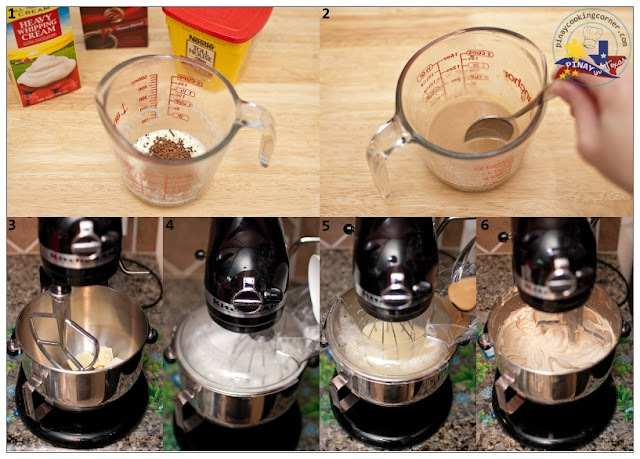 Increase mixer speed to medium and add cream mixture and beat for 3 more minutes. Put the first cake on a platter or cake stand. Spoon about 3/4 cup of frosting on top of the cake and spread evenly using a metal spatula. Shave some chocolate truffles on top. 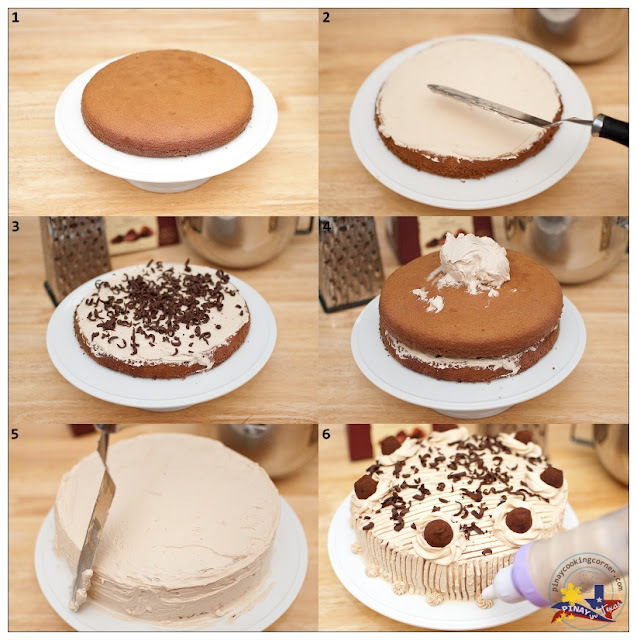 Place the second layer of cake and spread a thin layer of icing over the entire cake and let it stand for 15 minutes. Spread a thicker layer of frosting over the side, working from the bottom up to the top. Decorate as desired. happy anniversary and more recipes to come... cheers! what a gorgeous cake! Happy anniversary! congrats on 2 years of blogging. I must try this! One of my favorite flavors! 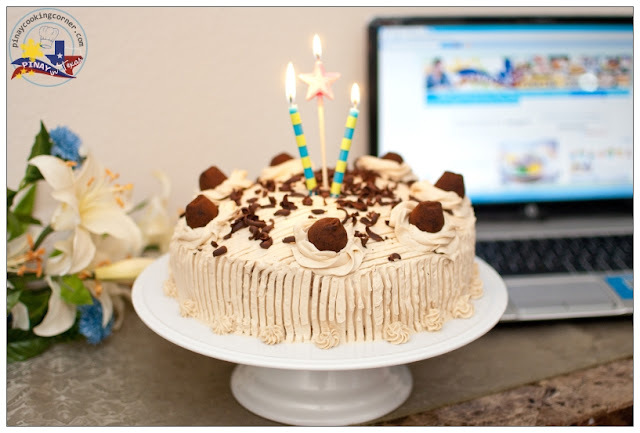 Congrats Tina for the two years of blogging and sharing the ever gorgeous and tasty recipes. I can understand why sometimes we slow down in blogging. Since of late, I have also cut down on blogging because there's more than spending hours in front of my laptop. With work and managing home affairs, I feel the time constraint for blogging. As usual, I admire your baking skills and I can't take off my eyes from the cake you have shared. Congratulations. Such a pretty cake ..love your icing skills. Happy anniversary. Like the cake no love it. Will try it out. Happy Anniversary to your blog, Tina! Keep up the good work you are doing as you are very good at it. More years to come. 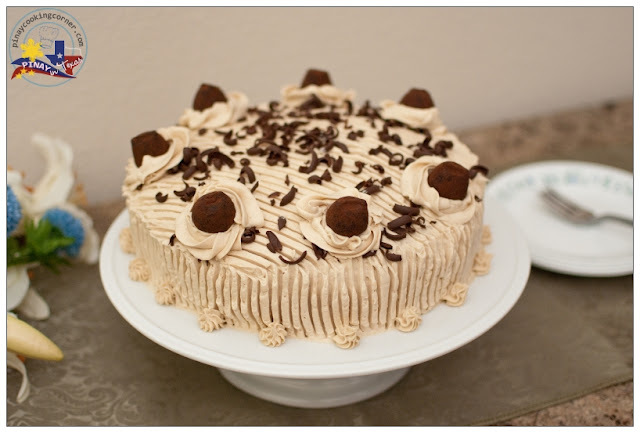 congrats on your blog baby's birthday Tina, Cake looks really beautiful. Wishing you many more years of happy blogging. Thanks everyone! PiTCC won't be here without your unending support! I owe it to all of you! Does it taste like the real Goldilocks cake? 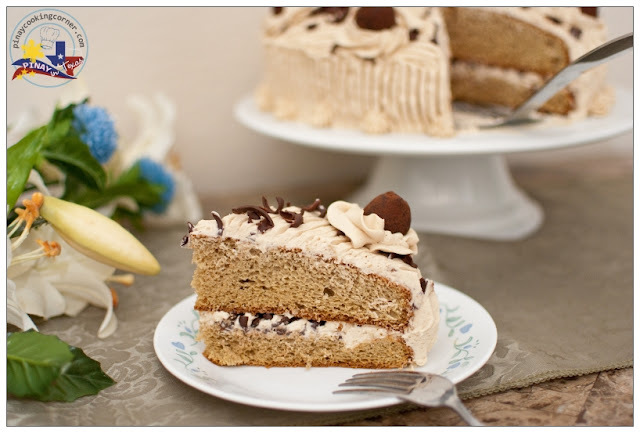 Have you tried the ube cake from the Goldilocks Bakebook yet? Hi ate Tina ask ko lang po kung pwede ko po bang gamitin ang regular coffee? any instant coffee powder will do. ask ko lang po .. anung temperature niya nung binake nyu po yung cake? Cake looks so good. Love to have it now. Oh it's really good, Savitha!